I'm starting my Christmas gift guide series a little earlier than normal this year, as I'm breaking it down and adding in some new categories for you all. This one is perfect for if you're on a tight budget, or if you're taking part in a secret Santa in the office or amongst friends. 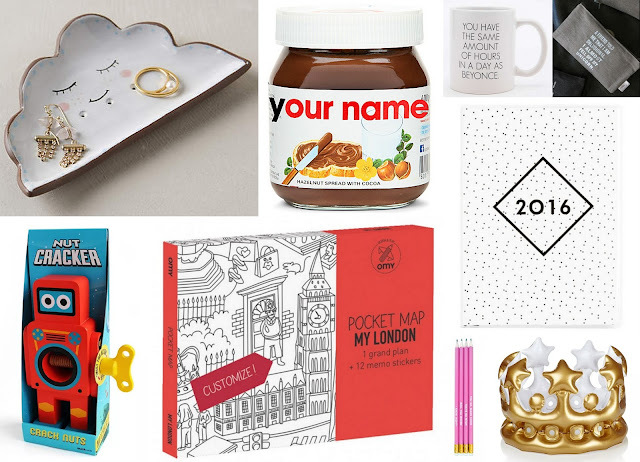 From a totally awesome (and somewhat hilarious) pouch to store bits and bobs in, to a nut cracker disguised as a robot, everything above is £20 and under, and available online. I've got my eye on the very large personalised jar of Nutella - this may be one gift 'idea' I nab for myself.